Avila Gardens Celebrates Mother Luisita…with Ice Cream! February is a special time for our Carmelite family since it is the month of our Mother – Mother Luisita, that is. Here at Avila Gardens we have an annual tradition of celebrating the beloved Foundress of our Carmelite Community in very creative, lively and nourishing ways, both spiritually and physically! Our Mother Luisita Ice Cream Parlor made its appearance again this year, complete with a rainbow-colored variety of cool, creamy treats and fun toppings. 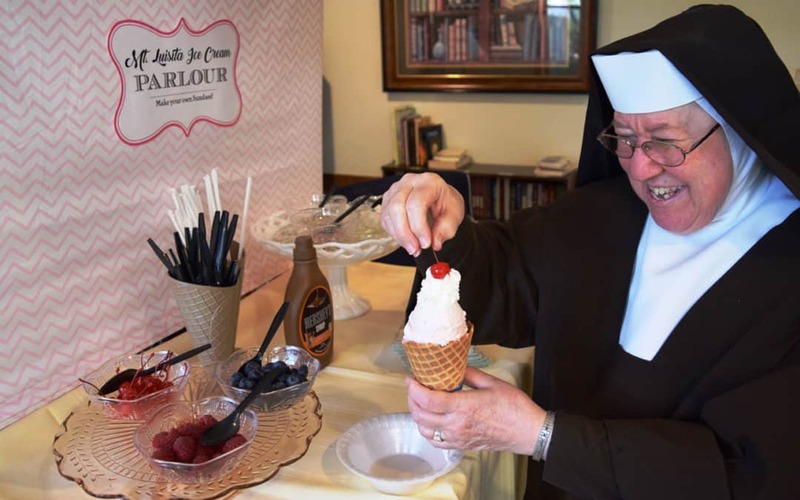 As our residents and Sisters streamed in to enjoy their waffle cones, banana splits and piled-high scoops, they also received the nourishment of Mother Luisita’s words. Thank you, Mother Luisita, for filling our hearts with your wisdom and light! Pray for us!